While today’s travels have been largely uneventful, we did get to cross the bridge pictured here. 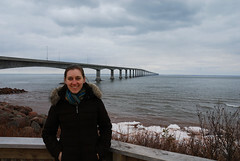 The Confederation Bridge links New Brunswick to the island province of Prince Edward Island (P.E.I.). Opened in 1997, the 13 kilometre bridge took 4 years to build and cost aproximately 1 billion dollars. It is hard to imagine how large it really is until you realise you have been traveling for 5 minutes at 80km/h and only just past the halfway point. P.E.I. became part of the Dominion of Canada in 1873 and as part of the agreement the Constitution was amended to include a regular steam ferry service to provide P.E.I. with services such as mail and passenger transit. This proved problematic as the closest point between the island and mainland (where the bridge now stands) freezes over during winter. Early suggestions for a permenant link were made surrounding the possibility of building a causeway. However these ideas were dismissed as the phenominal tides in this area flowing through a narrowed shipping gap would create currents strong enough to move rocks the size of houses and stronger than any freight ship could oppose. The company that built the bridge now recieves aproximately $44 million from the canadian government annually as payment up until 1932 when ownership will be handed over. They also charge a $40 toll on the south bound trip.